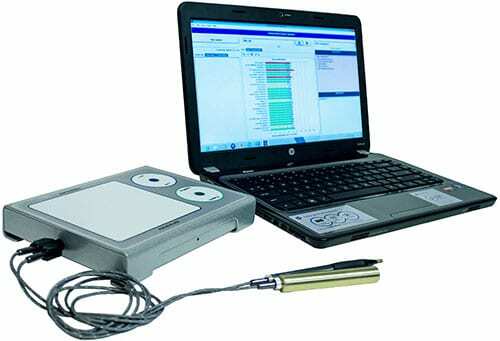 This system allows safe, rapid, comprehensive evaluations through a variety of EDD© (Electro-Dermal Dialog) sessions. It allows computer coded queries to be passed to the client, whereupon the practitioner can observe the answers, recorded as a change in skin conductivity, at the rate of about 30 per minute. No other screening method comes close in terms of cost, safety, speed, and interactivity. Versions of this technology have been successfully used by thousands of practitioners worldwide for almost 30 years now. For those who are skilled in it use, there is no system of equal accuracy in the diagnosis and resolution of complex individual health issues.